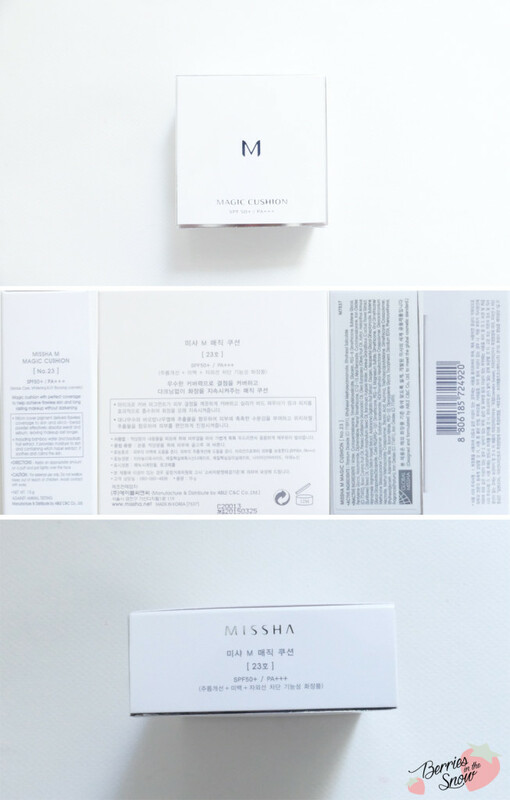 Four or five years ago my addiction for Asian beauty products started with my first BB cream, the Missha Perfect Cover BB, and today I’m happy to introduce to you the newest addition to the Missha BB cream family, the Missha M Magic Cushion! Missha is one of the worldwide famous Korean brands, especially their Missha M Perfect Cover BB cream is one of the most famous BB creams. They have a lot of online stores all over the world and are available in US/Canada, Australia and since some time they even opened up an online store for Germany, and a physical store in Ingolstadt in Germany! The products always come in a very luxurious looking packaging and the design is usually very mature and elegant and I think that it can be liked by almost everyone. 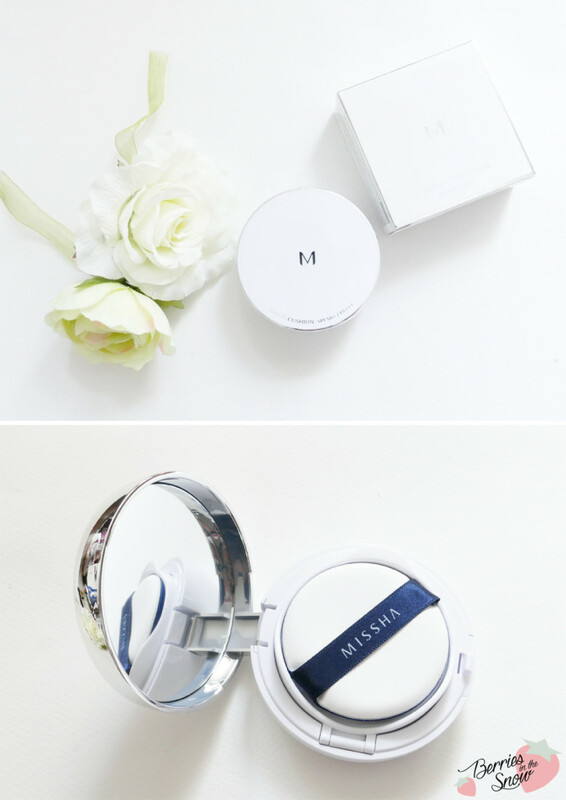 The Missha M Magic Cushion comes in a very simple, yet elegant, white cardboard box as well, as you can see from the images. The cardboard box contains the Korean and the English description. You’ll find the ingredients also listed on COSDNA >>here<<, but they are also listed on the cardboard box. I want to point out the fact, that if you look carefully below, you will notice that you’ll find a sticker on the side where the ingredients are listed. Below that sticker, you will find another ingredients list. Both lists are identical considering the single ingredients but in a different order. On this topic, you might want to check out the article by Tracy from fanserviced-b. She points out how the ingredients are listed in a different order depending on the labeling rules of the specific country. Nevertheless, I want to point out some key ingredients for the Missha M Magic Cushion. The packaging states Titanium Dioxide, Ethylhexyl Methoxycinnamate, and Ethylhexyl Salicylate as active ingredients. These three ingredients are the sunscreens included in this product and give the Missha M Magic Cushion SPF50+ and PA+++. Thus, the key targets of this cushion bb cream are winkle-care, whitening and UV blocking, in addition to giving a flawless appearing skin. Other ingredients which can be pointed out are bamboo water and baobab fruit extract which provide the skin with moisture, and hazel extract which has soothing properties. There are also some other plant extracts and oils included in the ingredients list. Compared to other brands Missha jumped the cushion bandwagon quite late. 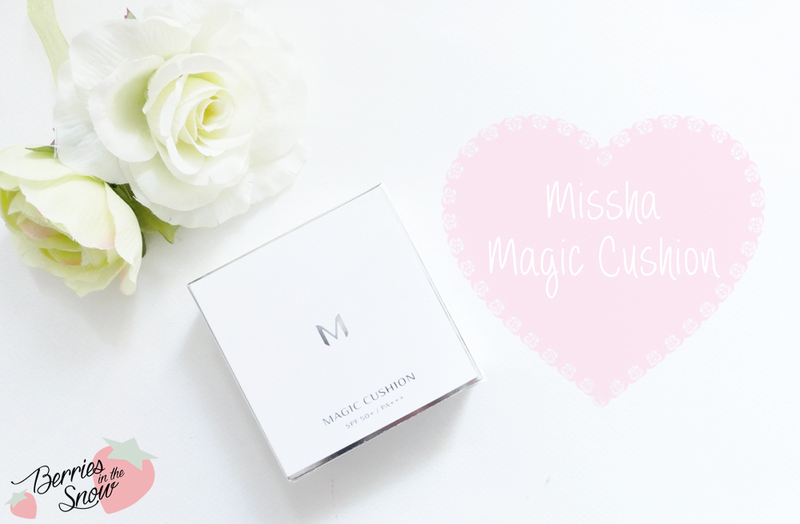 They released a DIY cushion case previously (you can find my review >>here<<), and I’m sure many were a bit confused and thought that the Missha Magic Cushion Case was already a real cushion. But the Missha M Magic Cushion was released later and so far there are three different cushion bb creams by Missha available in Korea: the Missha M Magic Cushion, the Missha M Magic Moisture Cushion, and the Missha Signature Essence Cushion. Missha US and Missha Germany only released the Missha M Magic Cushion so far, but I’m sure the others will be following soon. 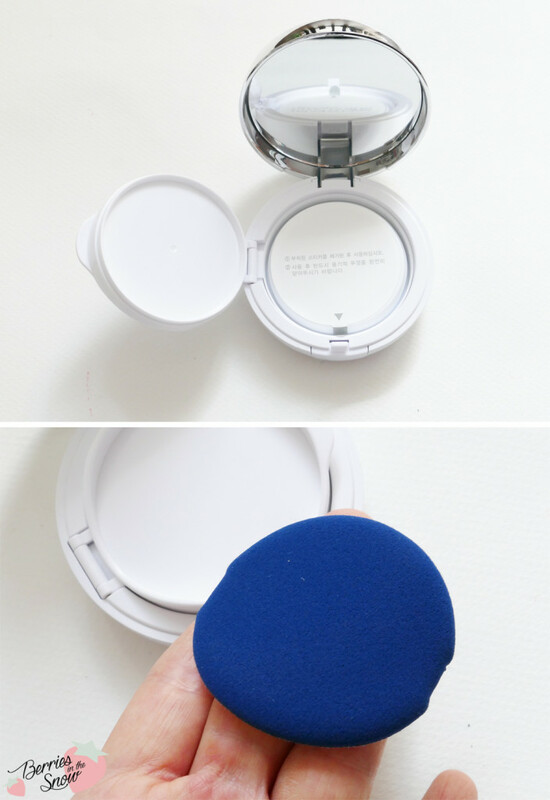 The design of the Missha M Magic Cushion is like all the other cushion foundations: it comes in a round container like most pacts come with. The container has a mirror in the lid, in order to be easy to use on the way and work as a perfect product to carry around in your handbag. There is also an application puff inside the container. These, typically blue colored ruby-cell sponges are super soft and perfect for applying a natural looking layer of the bb cream. I also have the feeling, that the ruby-cell sponges are kind of cooling while patting the product on your face. Now, below the second plastic lid, you’ll find the “heart” of the cushion, the sponge soaked with the BB cream/ foundation. This plastic container inside the pact case can be removed and replaced once empty. Some brands can even exchange their refills amongst each others cases, some can’t. I have an Innisfree, a Pongdang and a Missha Cushion so far, but they cannot be exchanged with each other. The Missha M Magic Cushion also doesn’t fit into the Missha Magic Case, but it fits with the other Missha cushions. 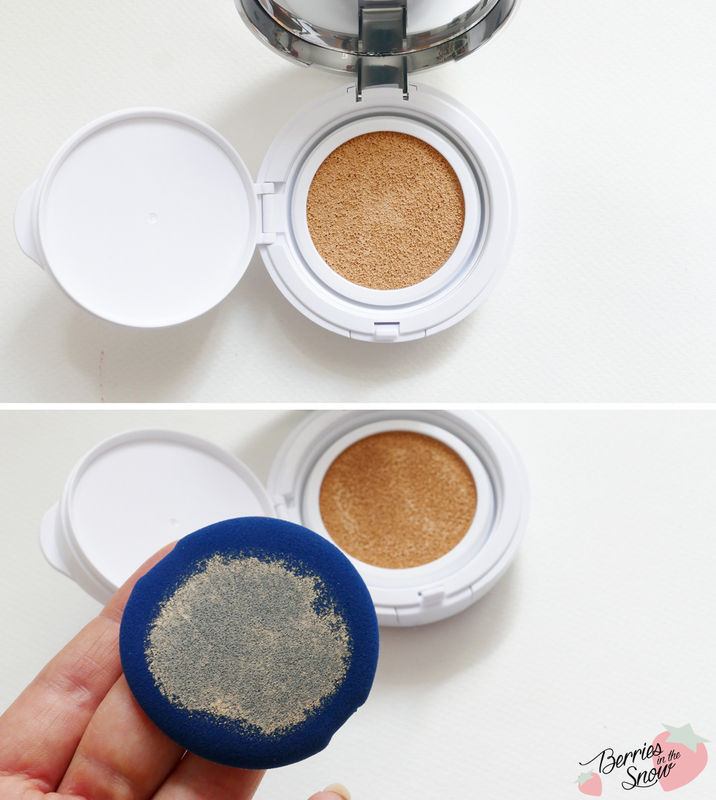 The Missha M Magic Cushion is available in two shades: #21 Light Beige and #23 Natural Beige. Since it is summer at the moment I chose #23. 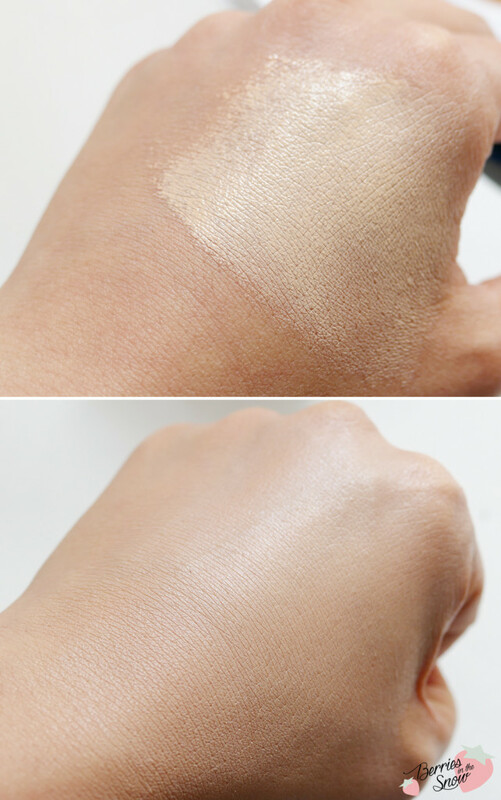 I’m a bit tanned at the moment and although it looks a bit bright on the swatch on my hand, it looks okay on my face. Although the Missha M Magic Cushion has a semi-matte finish it doesn’t feel drying, but rather moist. Also, if you have used primers or achieved a nice glow with your skincare routine before it doesn’t cover the glow, but leaves the natural shine on your cheeks for example. 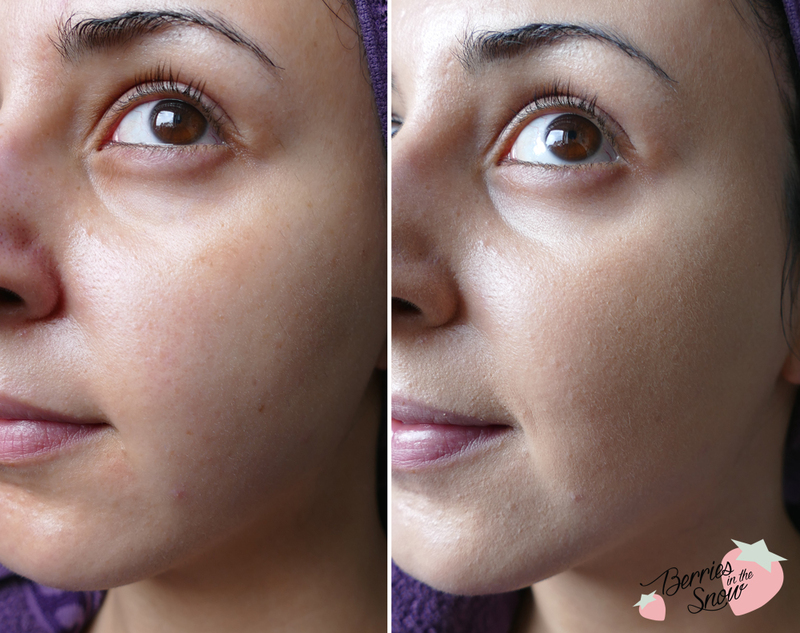 The coverage is medium and it doesn’t make the skin look unnaturally cakey. I will review the Missha M Magic Moisture Cushion in comparison soon, but so far I love this cushion. The finish is pretty and it lasts quite long without getting dry or flaky around my chin or nose. It does not make my skin oily either, probably because of the silica-bead powder, which is supposed to absorb sweat and sebum. The scent of the Missha M Magic Cushion is kind of creamy, but not flowery like the Missha Perfect Cover BB cream for example. It is not super strong either. So far I am very happy with the Missha M Magic Cushion. I had high expectations for it, since I love the Missha Perfect Cover BB cream, and I was afraid to be disappointed with the cushion, but at the moment I’m using it daily. I still love the Innisfree Ampoule Intense Cushion though, but it is shade 21 and a bit too light for me atm ;D I’m very curious about the Missha M Magic Moisture Cushion though and I hope that I will like it as much as this one. 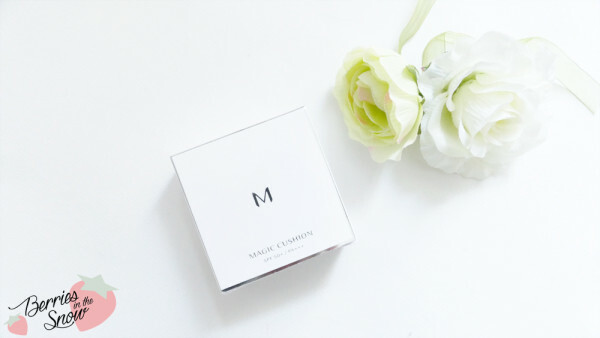 I received the Missha M Magic Cushion from Missha Germany. They deliver within Germany, but also outside Germany. So if you are somewhere in Europe it might be faster to consider ordering from them instead of Korea. My package arrived after 2 days, which is awesome when thinking about the 2-4 weeks of waiting when ordering from Korea :D The Missha M Magic Cushion retails for 15.40 €, and they had a launching event where it was only 10 €! I can recommend you to take a glance occasionally at their webpage, instagram, and facebook. By the way: Missha is one of the Korean bands which are against animal testing! You can also find the Missha Cushions on any other official Missha Store or Amazon.com. I was expecting this review ^^, I’m so happy to see it was good, because choosing a cushion this days it’s overwhelming. There are so many brands, so many types, prices, finish, all. This is really affordable too. I’m loving some Missha products, hope be able to try this soon. I´m not fan of Missha but this cushion looks pretty nice for everyday. The coverage look pretty decent. Hello I wonder if you leave matte skin . I want to buy the version of minions but do not want an oily skin. The you recommend ? If you like to visit my blog , you are in Spanish but has the option of translator.